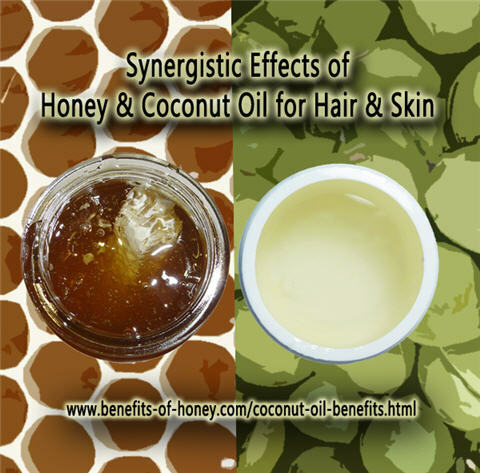 Honey and coconut oil benefits can make a significant difference in keeping your hair and skin in superb health. Check out these awesome rejuvenating masks below. The synergistic effects of honey and coconut oil are impressive in this simple and highly popular DIY pre-wash hair treatment. They add shine, moisturize and strengthen the hair effectively. Other known benefits of the hair mask include making hair soft, more voluminous, reducing frizz and greying of hair. The anti-fungal and anti-bacterial properties of coconut oil and honey also help fight and prevent dandruff and other scalp issues. 1-2 tablespoons of raw liquid honey and 1-2 tablespoons of unrefined (virgin) coconut oil (melted) (in 1:1 ratio, amount depends on hair volume). 1. Mix the two ingredients well in a bowl. 2. Apply onto the hair beginning from the hair ends to the scalp, using your fingers to message, comb and work through the hair to thoroughly distribute the mixture. 3. Put on a shower cap and leave it for about an hour. Allow the mixture to penetrate into the hair shaft. 4. Shampoo and wash. There is no need to follow with any conditioning. The mixture of honey and coconut oil benefits those with dull, lifeless or wrinkled skin as it effectively brightens complexion, hydrates deeply and adds a healthy glow to the skin. It also does wonders in helping to even out skin tone and lighten age spots. 1 teaspoon of melted unrefined coconut oil. Honey possesses polyphenols, which are antioxidants that can effectively counteract the effects of free radicals and help repair damaged tissues. Containing alpha hydroxy acids, honey also makes a great gentle exfoliator for the skin. As for coconut oil, it contains lauric acid, a medium-chain fatty acid that has been proven by studies to be antibacterial, antiviral, antifungal, and have anti-inflammatory benefits. Phytonutrients and polyphenols, the tissue-protective properties in coconut oil, also act as antioxidants. All these properties make coconut oil a great moisturizer, help fight bacteria associated with skin infections, acne, and other troubled skin conditions. 2. Mix the two ingredients well in a small bowl. 3. Apply the mixture onto the face and gently message it into the skin with gentle circular motions with the help of your finger tips for 2-3 minutes. 4. Leave it on for about 20 minutes. 5. Wash with warm water. Learn how to make the easiest DIY lipbalm and handsalve in minutes: Coconut Beeswax Lipbalm Recipe. End of "Honey and Coconut Oil Benefits for Hair and Skin". Go to "Natural Skin Care"